The south-east coast of Ireland from the Old Head of Kinsale to Tuskar Rock. Scale: 1 : 167.000. One and two-minute gridlines. Larger scale plans of Dungarvan, Waterford, Youghal, Cork lower harbour, Crosshaven, Kinsale and Dunmore east. Tidal stream diagrams. 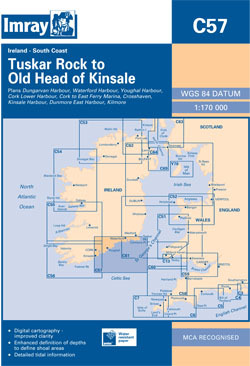 2011 edition includes revised depths in approaches to Kinsale Harbour, Waterford Harbour and Cork Harbour.